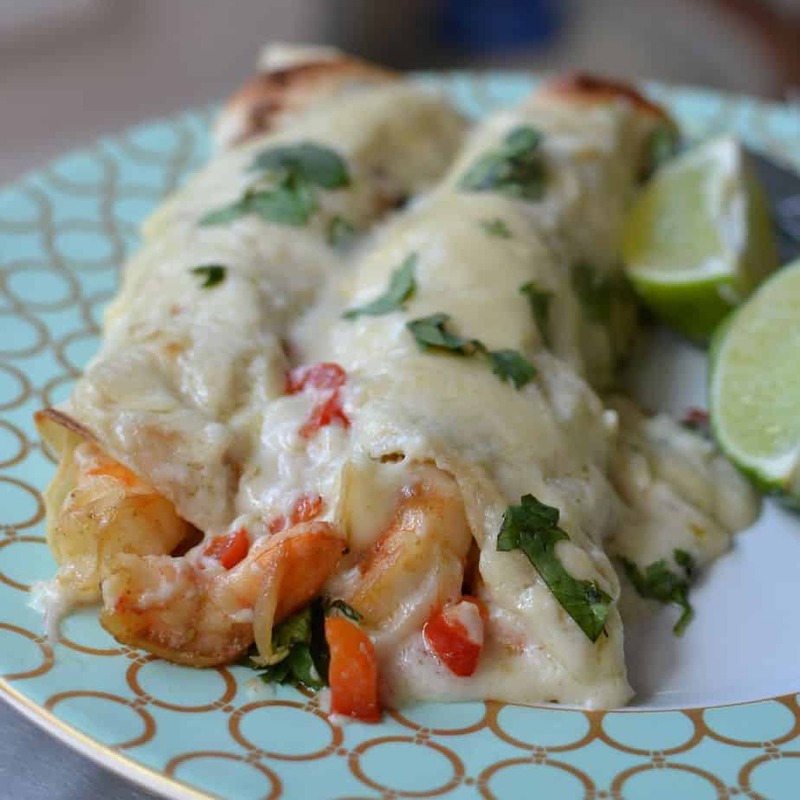 Creamy Shrimp Enchiladas bring together fresh shrimp, shallots, red bell pepper and garlic all wrapped up in a creamy Monterrey Jack cheese sauce. Elegant enough for company yet easy enough for a weeknight. 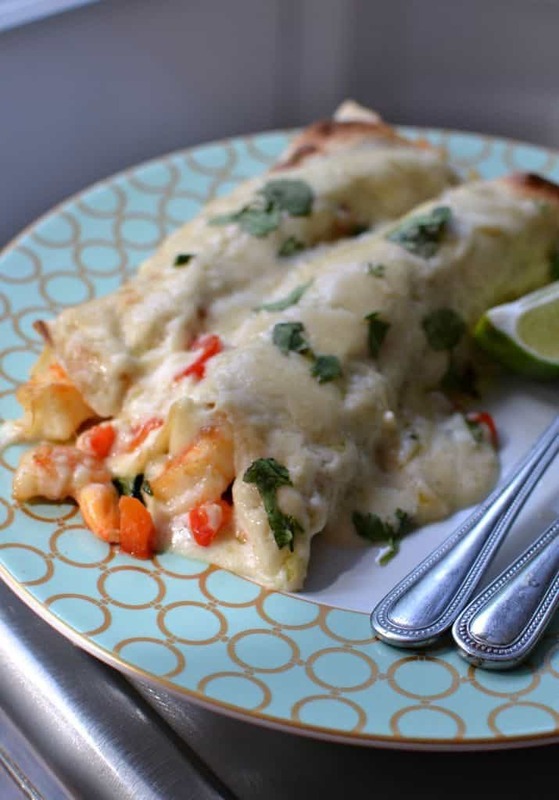 Why Shrimp Enchiladas are perfect for you and your family. Not everyone is a shrimp lover but for those of us who are this is a must try. These Easy Creamy Shrimp Enchiladas are a shrimp lovers dream and really only require about twenty-twenty five minutes and are worth every minute. Fresh shrimp, sweet red bell pepper, jalapeno (don’t panic the amount can be adjusted) garlic and shallots are all sauteed with just a tad of seasoning for just a couple of minutes. This mixture is then rolled in flour tortillas. Meanwhile you are going to make a creamy cheese sauce with just a few ingredients including sour cream and Monterey Jack cheese. They are popped in the oven for just a few minutes to brown off the cheese and reheat. Sprinkle with fresh chopped cilantro and you are your loved ones are ready to chow. A couple of quick helpful hints to send this recipe over the top! If available use wild caught shrimp. They are better for you and in my opinion taste better. Do not overcook the shrimp. Things move pretty darn fast. The cheese sauce comes together real quick so this recipe does not have much cushion in it for folding the laundry or making a phone call. If you are in a super hurry skip the oven step. Keep the shrimp mixture warm on a covered plate. Wrap the shrimp mixture in the warm tortillas and drizzle with the cheese sauce. That is the way we eat tacos around here. We just fill them and plop so many on the first person’s plate and keep the assembly line going until everyone has tacos. Now some of the family might be almost done by the time the last person is served but sometimes you just have to roll with the flow. My daughter and I are huge shrimp fans! Here are some more scrumptious shrimp recipes for your enjoyment!! Other shrimp recipes you will love! 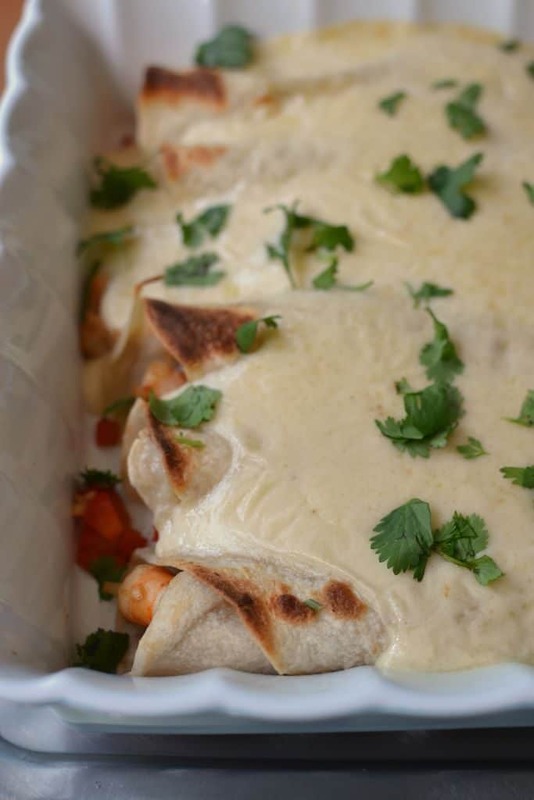 Give my delectable Easy Creamy Shrimp Enchiladas a try and let me know what you think! I would love to hear from you! 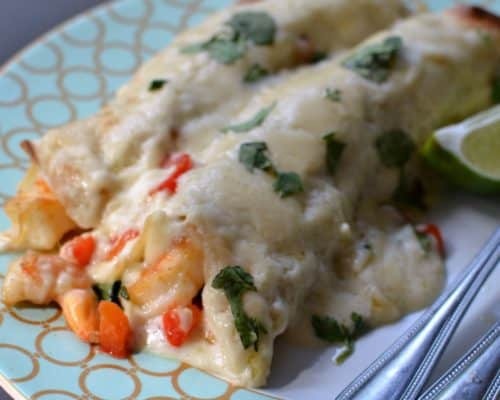 Creamy Shrimp Enchiladas bring together fresh shrimp, shallots, red bell pepper and garlic all wrapped up in a creamy Monterrey Jack cheese sauce. Preheat oven to 400 degrees. Spray casserole dish with nonstick cooking spray. Divide the shrimp mixture evenly between the tortillas, roll and place in casserole dish. In same skillet over medium low heat melt butter. Whisk in flour and cook for 2-3 minutes; whisking constantly. Slowly whisk in chicken broth and cook until slightly thickened; 2-3 minutes whisking constantly. Slowly whisk in Monterey Jack cheese until melted. Whisk in sour cream. Spoon over shrimp enchiladas. Place in oven for 7-10 minutes. Sprinkle with cilantro and serve. The oven step can be skipped and you can assemble and spoon cheese sauce over them as you serve them. I made this recipe last night for my family and boy, we’re they ever a hit! Thanks for sharing this super yummy, super fast recipe! You are so welcome. The pleasure was all mine. I am so glad that you and your family liked them. I wish I had one right now for my breakfast! LOL!! 8 inch tortillas. I will add that to the recipe. Thanks so much Gigi Ann! We think they are delicious!! When do you use the cumin? And do you need to season the shrimp? Hey Tiffany thanks for the heads up. Sorry about the delay. The garlic and the cumin are added the last 30-60 second of cooking the shrimp. I have updated the recipe to reflect that. You can salt and pepper the shrimp before cooking however they pick up a ton of flavor from the other ingredients in the pan.